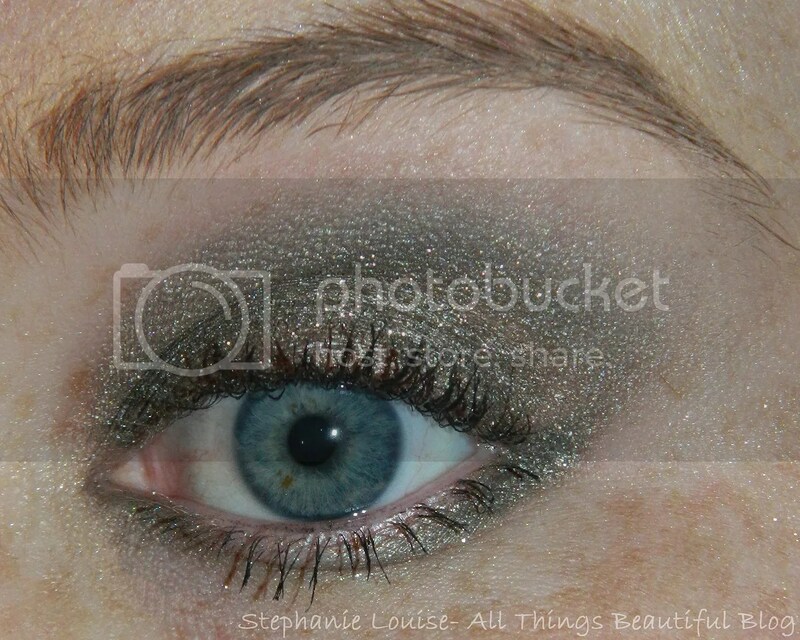 Quick & Easy Daytime to Bombshell Nighttime Eye Step-by-Step Tutorial! 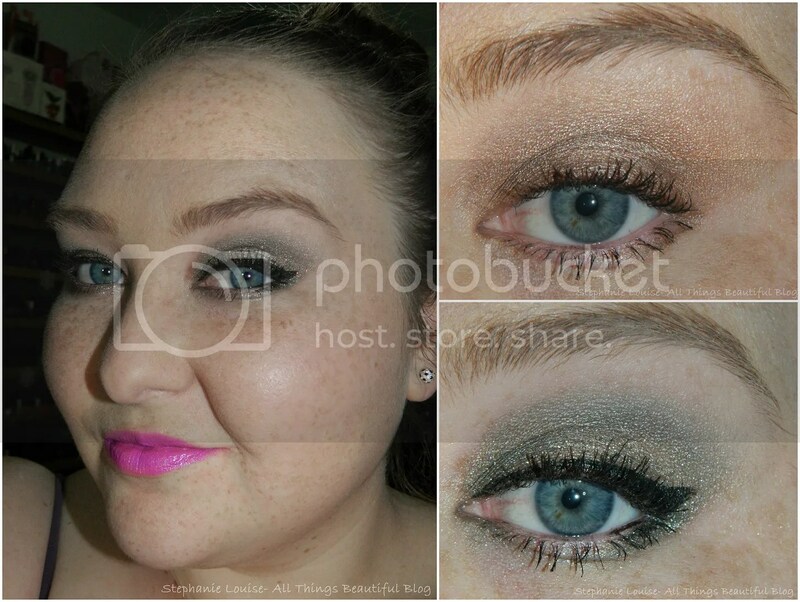 So you want to see how I went from New Years Subtle daytime to New Years Eve Bombshell eh? Well, you’re in luck! I’m seriously wearing this as I type! I refuse to be the only one who needs to wear a simple look during the day & then transform into a New Year’s Eve goddess. Aren’t there any other real ladies out there? 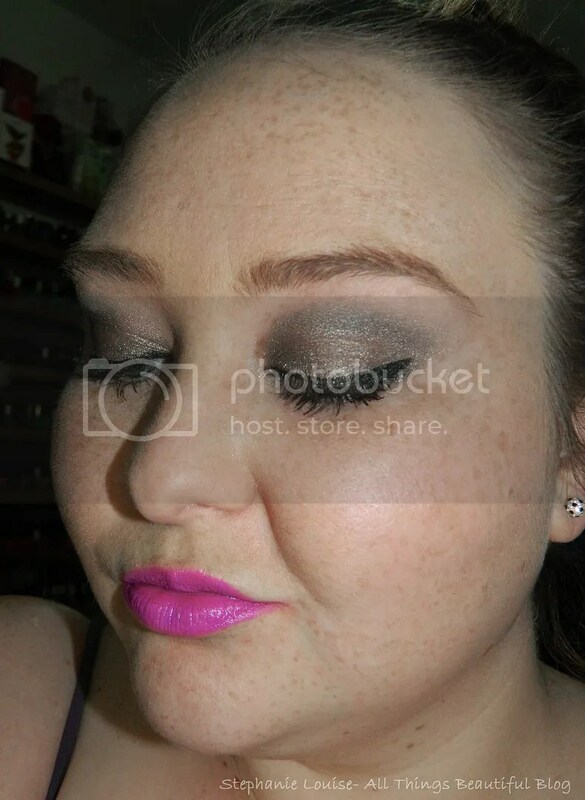 Well, this is my look- taking my super quick 3-5 minute eyeshadow look, wearing it all day, then transforming it into a look that only looks like it took ages. Because it is seriously simple & perfect for pretty much any time of the year. Keep reading to see the steps! So let’s start with my daytime look- the main components are all drugstore. I used the Maybelline Color Tattoo in Barely Branded (Barely Beige works great too) as my base, no primer necessary for my lids. Over that is the Wet n Wild Color Icon single in Nutty which is a gorgeous taupe & to blend out my crease & highlight I used Wet n Wild Color Icon single in Brulee which is my perfect skin match. That’s it. No muss, no fuss, & seriously barely any work whatsoever. My brows are the Milani Brow Fix Kit in Light, my mascara is Tarte Lights Camera Flashes, & my eyeliner is on the tightline is It Cosmetics No-Tug Waterproof Gel Eyeliner in Black (review here). With this look I wear a natural blush, whatever face product I decide is necessary for my skin at the time, & pretty much any lip color I want although pink is the most common. Concealer as needed. Again, I just don’t have to think about this look. Often when I’m needing to go on a date night, attend an event, or go out at night with the girls I want something more fun. But not too much work. When your makeup still looks pretty flawless by the end of the day it seems a waste to take everything off. Sure, if you need to touch up your face with powder or new foundation have at it but the picture of my eyes taken above was after 9 hours of wear. It still looks pretty darn good. Here’s how to go from day to night! If you have 1 minute- If you are in this big of a rush, change your lip color. If you try to do much to your eyes you’re likely to be so busy rushing that you coat your lashes in new eyeshadow or mess up your liner. Lips are the easiest to touch up & switch up. In the photos I’m wearing an awesome pink toned purple called African Violet from Black Radiance. This creamy, bold shade also leaves behind a pink stain that I love. 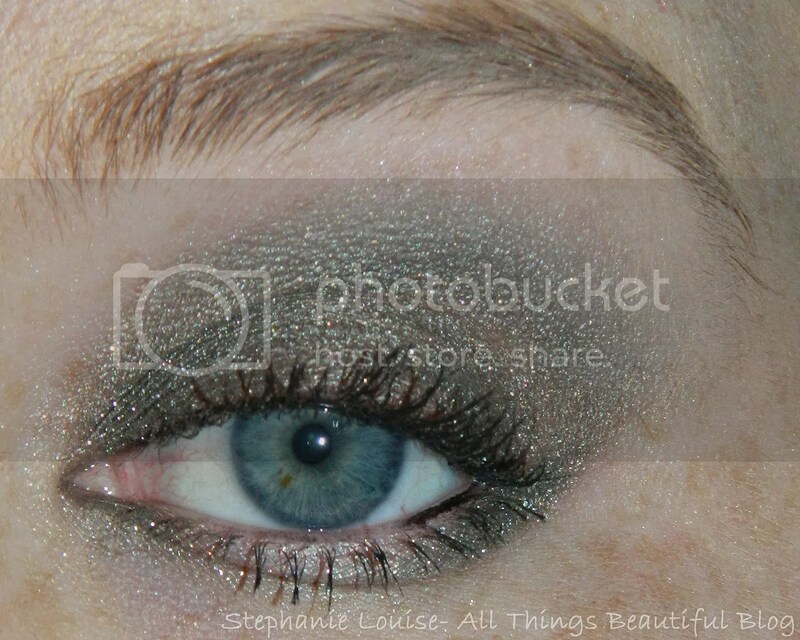 If you have 2 minutes- Apply a fabulous metallic eyeshadow, preferably one you can apply with your finger. Don’t look for a cream because you don’t want to apply a cream over a powder but do look for something you can blend out with ease. My go-to shade is the Lancome Color Design Eyeshadow in Single in All That Glitters which is an amazing metallic silver shimmer with the barest hint of green. Something metallic means you don’t have to do too much work because it will catch the light & reflect the light on its own. Blend out with a fluffy brush to blend the lines, I still used Wet n Wild Brulee. If you have 5 minutes- Do previous steps & then add a bit of liner to your tightline then extend down to just the outter 3rd or 4th of your waterline. Don’t close off your eyes because it won’t make them look as bright or big. Curl lashes. If you have 7 minutes- Do everything above then add smoked out liner or my favorite winged eyeliner. I personally like the Stila Stay All Day Liquid Waterproof Eyeliner in Black which has an excellent tip for quick application since I’m accustomed to it. Does the wing make you nervous because you’re in a rush? Skip it! Add some black or another deeper shade (Jewel tones look awesome!) then smudge out the line for a sultry look. If you have 8 minutes- Everything above! Add a coat of lightweight, non-clumping mascara like Covergirl Clump Crusher for extra black lashes & don’t forget a quick curl + touch up anything under the eye! Not sure if you can tell but the quick swipe of mascara makes my lashes look much better & fuller as well! If you’re a falsies fan then those can be used as well or instead! Obviously take into consideration if you need to touch up anything else on your face like concealer or blush but that is pretty much all I do! 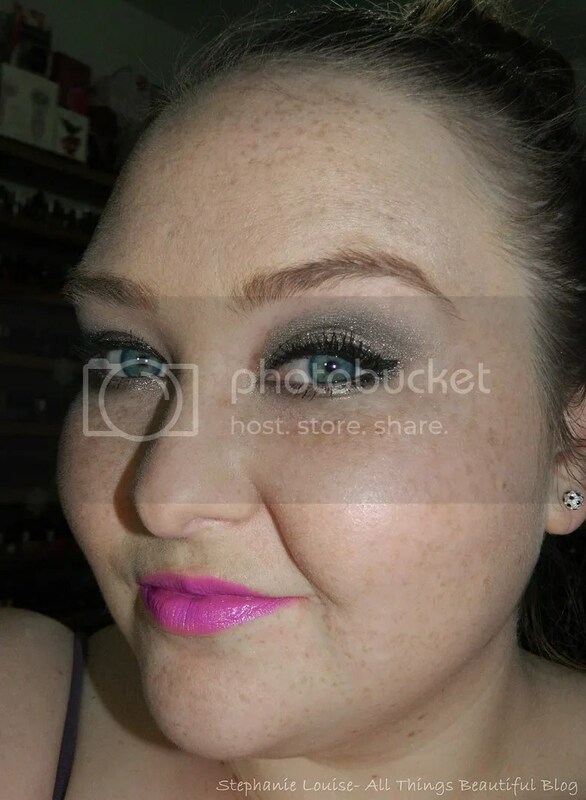 I usually opt for a bold lip because then I rarely apply too much more of a flush! In the photos I’m wearing an awesome pink toned purple called African Violet from Black Radiance. If you have dry skin like me, check out my review of the Reviva Labs Vitamin E Stick– the perfect pick me up for touching up foundation that looks dry. Powder isn’t always the answer for us dry skinned gals! Did you find this look helpful? What do you change into for a going out look? If you liked this post please let me know below & I’ll try to do some more! Cheers to a beautiful new year! Skin: Relogy 3 Step Skincare System Review Glamazon Spring 2012 Collab: Coral Eyeshadow for Daytime Beauty Box 5 August 2013 featuring Nubar, Be A Bombshell, & More! Beauty Box 5 Box for July 2013 featuring LA Fresh, Be A Bombshell, & More!